What is a horse gait? 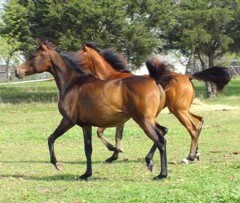 Horses have distinct ways of walking and running. There are unique types of movements that only some breeds are capable of. We call these "gaited horses", because their gaits go beyond the four basic ones that we are discussing here. What are the basic horse gaits? Horses have four distinct forms of movement, although some intermediate gaits are also possible. These are the walk, the trot, the canter (or lope) and the gallop. At the walk, the four legs are placed to the ground in regular succession -the sequence of footfalls is left fore, right hind, right fore, left hind. This is a four-beat gait; when listening to a horse walking on a hard surface, four distinct sounds should be heard. The trot, however, is a two-beat gait; the diagonal legs are moved synchronously. The footfalls in sequence are left fore with right hind and right fore with left hind. At the canter, one foreleg leads while the other foreleg and its diagonal hindleg move together, and the other hind leg moves independently. This is thus a three-beat gait, with a footfall sequence (with a left fore lead) of right hind, then left hind with right fore, followed by left fore. There is a period of suspension after the leading foreleg leaves the ground. In the gallop, the stride lengthens and the period of suspension is also increased. At the same time, the legs that were working in a diagonal at the canter are unable to do so at this faster pace. They become separated, so that the hind leg hits the ground slightly before the diagonal foreleg. The footfall sequence (with a left fore lead) is right hind, followed by left hind slightly before right fore, followed by left fore. The gallop is therefore a four-beat gait. In the canter and gallop, either foreleg may lead while going in a straight line, but it is usually the inner leg that leads on a bend. The leading leg has to take more weight and do more work than its opposite number. Tired horses often change legs in mid-gallop for this reason. Read the next horse riding tips article on Dreaming of Buying a Horse?.